Having done all of the hard work piecing the engine back together I simply needed pop it back in. It all sounds so easy, in those terms. Sadly, it never really is. Once I had the engine back together I used the hoist to manoeuvre it back into position in front of the car, the nose of which was on the stands as high as they would go. I lowered the engine onto a large sheet of cardboard and detached the hoist. Dragging the card to get the engine back under the engine bay seemed a lot harder work that it did to get it out. When it was roughly in place I re-attached the hoist, which would barely reach, but I got it there. Lifting the engine into position was tricky as the angle of the lifting arm meant that it kept hitting some part of the engine bay and therefore needed constant adjustments. 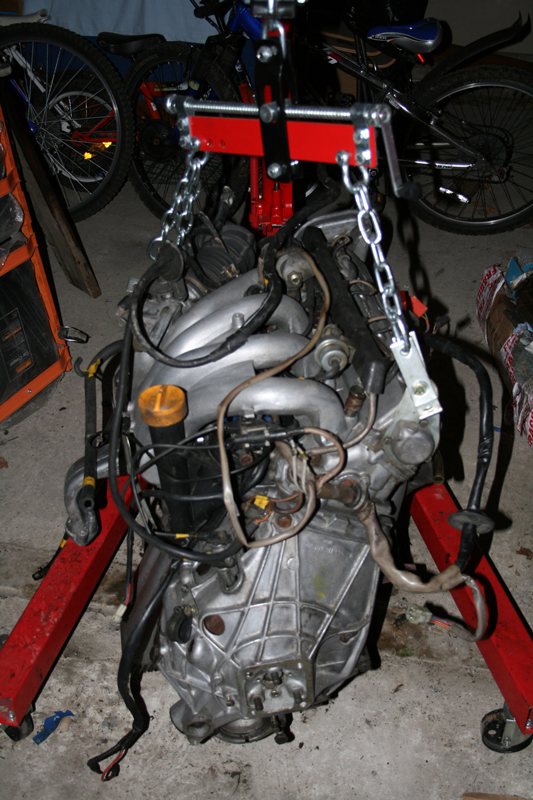 The first stage of reconnecting the engine was to slide it back onto the torque tube. For some reason this didn’t want to go. I tried lots of different approaches, different heights and modified the level of the engine, but it didn’t want to go. I did something, not entirely sure what, after 25 minutes and it just slotted home. By this point though it was getting late so I decided to leave the engine hanging and called it a night. The following morning I fitted the wishbones took longer than I had hoped, even with the bushes in place; fitting those was a new kind of hell! A little more time was spent swapping the brake dust plates, which meant removing the disks; not that difficult but time consuming. I then installed the crossmember and was able to remove the hoist for the final time. 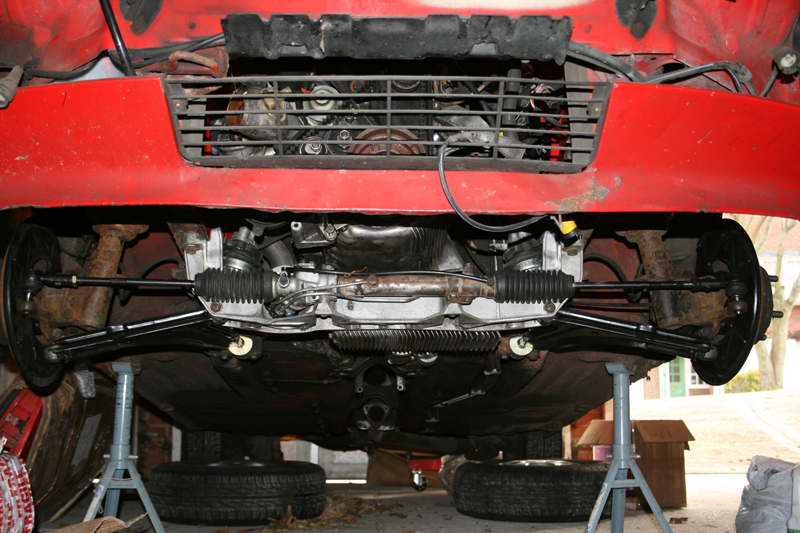 The process took a lot longer than I had hoped, I had major problems getting the steering rack hooked back up; this was partly my fault getting not quite having the steering column universal joint lined up quite right and, well, a pain of a design – not that there is an alternative. After I’d got that far it was a case of putting the radiator back in, installing the starter and then connecting up all of the cables and hoses. This was made easier by labelling system and file of photos, although it would actually be quite difficult to get most things in the wrong order. I also discovered putting it back in, that turned in the right direction the DME connector fits easily through the firewall if turned in the right direction – it took an age to remove. The process took longer than I’d expected, largely due to my wanting to recheck everything as I went. The final job was to fit the airbox, I say final, I left the belt covers off so I could check them when I started the engine for the first time. I just needed to add the fluids. The oil was easy, most impressively it went in and didn’t come flooding back out in a hurry, so I was happy there. Filling and venting the coolant system was straightforward too; there is a small bolt on the top of the engine, I loosed this and kept pouring in the coolant until I saw it appear in the venting hole. Once the venting bolt was torqued back up I topped the coolant up. The car was ready. I put the key in the ignition and gave it a twist, had I done anything that meant it would explode? Not that time. Largely because nothing happened. I went around the usual suspects and when checking the fuel pump I noticed the fuel line was still clamped off. Doh. Removed I went to try again. Something and nothing that time. As I was checking the engine bay I noticed a cable unplugged on the engine wiring loom, I had disconnected it so that I could re-position the cables, and then obviously not put it back. This time, success! The car started and the engine sounded good. I still had some work to do, the new wishbones needed fitting and the steering rack connecting, but that could wait until Sunday. I called it a day early, contented. Sunday morning. Once everything was on I setup the steering (I’ve made a few changes, but there will be another post for that) and used a couple lengths of wood to align the wheels as best I could, after that, my car was done. I checked the MOTest web site, and they were still open for a few hours, so I took the car over to Reading to put it through an MoT, with the car in their hands I went off for lunch, happy. Normally I get very anxious when my car’s in for an MoT, even when I know it’s tip-top, there was no such feeling this time, so confident was I that it was going to fail. I put it in to check the omissions and get a list of jobs I needed to get a pass, the re-test is free so I thought I may as well. Plus it allowed me to give the car a shakedown on the run to the test centre. On my return to collect the car I was ask to wait as the tester was preparing the paperwork. Lots, I assumed. That figured. A little while later and I was presented with a fail certificate; loose bolts on the track rods (that’d be me) and a light bulb. The work was done and the immediate re-test gave me a pass certificate! I questioned this several times, not believing the omissions would be right, but no, everything was in order. I could not have been happier! As a post script to this post is a confession that not everything ended well. A week of so after the success and the car wasn’t starting properly, until one day it refused to start. I took the starter off and tested it, but it was spot on. The problem was the ground connection on the engine block, it was loose; it allowed enough power through for everything to appear okay in the cabin (light, volt meter, etc) but there wasn’t enough juice to turn the starter. Once tightened I was back in business. 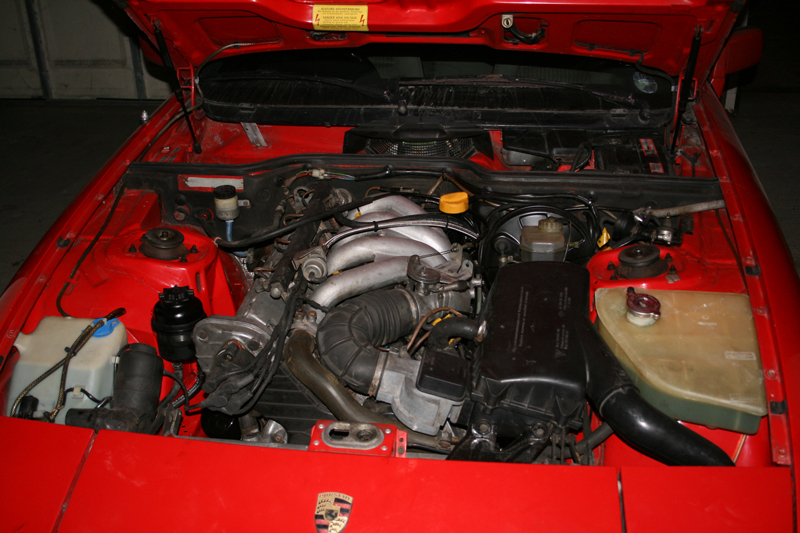 It was as I had the bonnet up with the engine running that I noticed a leak from the fuel feed line, a small jet of petrol sprayed into the engine bay. I used duct tape to limit this to a dribble down the hose and ran the car just long enough to get it back in the garage. I removed the damage hose and took it to Pirtek in Reading who made up a replacement on the spot. Once in, all was good again. Given it was the first time that I had done anything like this with an engine I was feeling rather pleased with myself, and as I often maintain, if I can do this, anyone can. Except, maybe, a few of my inept friends.